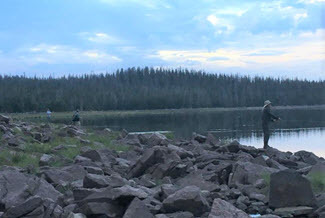 "Your Pack Train to the Utah Wilderness"
These wilderness camping and fishing trips are accessible only by horseback and are very popular because of the extremely good fly fishing, beautiful, peaceful and relaxing surroundings. 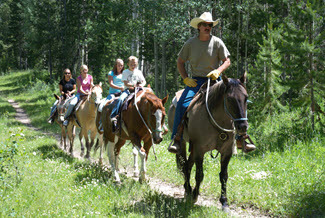 We offer trail rides in the Lake Fork Drainage of the High Uintas near Moon Lake. These are fun rides through beautiful forest surroundings. We have a variety of trail rides to choose from including full day trips. Guided or Drop Camp Elk & Mule Deer hunts in the Uintas, Book Cliffs or Wasatch Mountains that you will remember for a lifetime. 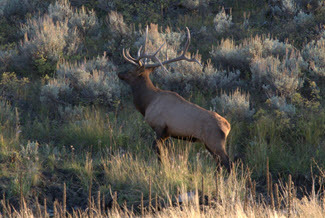 We offer Limited Entry Bull Elk hunts, Cow, Spike Elk and Mule Deer hunts. Starting planning your Summer Adventure NOW. We offer trail rides, wagon rides, catered trips and drop camps. Discover the Utah Outdoors with Us! 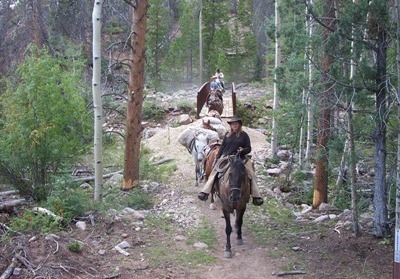 We’re your "Pack Train to the Utah Wilderness"
Utah horseback riding vacations and horseback riding day trail rides in the Uinta Mountains have never been more exciting. Flying J Outfitters has been offering Utah wilderness adventure horse pack trips in the High Uinta Mountains and the Book Cliffs area of northeastern Utah for 33 years. Flying J Outfitters offers the best of Utah wilderness adventures with expert wranglers and nature guides coupled with amazing Utah fly fishing. (The Uinta fly fishing guides bring you by horse to just the right spots). Beautiful Utah horseback riding vacations and horse trail rides, camping, nature and wildlife photography and historic exploring in the Book Cliffs are all available. Horseback day trips or week-long Utah horseback riding vacations, Utah wilderness adventures, fly fishing trips or Utah big game hunting trips can be yours with packages that are family affordable, expertly managed and incredibly impressive. Our wilderness High Uinta trips take you into the Ashley National Forest Yellowstone, Swift Creek or the Lake Fork (Moon Lake) Drainages. Utah’s highest peak, King’s Peak (over 13,500 feet in elevation) is in our permitted area. This area offers world class fly fishing, bait fishing and spin fishing for wild fish like, Rainbows, Brookies, Cut Throats and California Goldens. Spend a day in our care on the back of one of our gentle mountain horses and we’ll offer you a horseback nature experience that’s breathtaking. Just a few hours with our nature guides can take you to wildlife areas, elk herds, and natural wonders that are there to be experienced only at the time of your horseback adventure. The Uinta Mountains wilderness adventures with Flying J Outfitters is ultimately achieved with our catered full-service multi-day horseback camping pack trips including wranglers, our food, our supplies, our Utah fishing guides, our nature and wildlife knowledge, and your enjoyment and fulfillment in a guided horseback riding vacation that will make you want to pack it all in and just stay forever. Your adventure is up to you. Like to photograph ancient petroglyphs? Nature? Wildlife? Big game? Scenic vistas? Horseback riding? Exploring Utah backcountry? Maybe the best of Utah fishing with our expert fly fishing guides for the high Uinta Mountains would be satisfying. Perhaps you’d just like your own time to ride a horse and explore on your own. You tell us what aspects of the beautiful Uinta Mountains of Utah that you’d like to experience, and we’ll make it happen for your special Utah horseback riding experience. By the day, by many days… for yourself, for the group, or especially for the family, we urge you to reserve early for the horseback riding high Uinta Mountains time of your life. Our Book Cliffs trips take you into the road less area on horseback where the wildlife is abundant. We like to do these trips in the spring time when the Elk, Deer, Bear and Cougar are having their young. Chances are very good to see some wildlife on this horse trip. Or if you prefer you can do a horse trip into the world renowned Nine Mile canyon and photograph the world’s largest Fremont rock art & petroglyphs known to exist. We cater to our clients needs so each horse pack trip is individually your own. We also offer Horseback riding and Horse Trail rides from the Lake Fork, Moon Lake Trail head from the last weekend in May, thru September. Enjoy your tour through our web site and if you have any questions please Contact us.